One of our earliest posts on this site was regarding noted Canadian Sherlockian and Baker Street Irregulars member Peter Calamai being appointed as a member of the Order of Canada. Since 1967, more than 6,000 people from all sectors of society have been recognized for their unique contributions that have made Canada a nation of service, innovation and excellence. These distinguished citizens are the members of one of Canada’s most prestigious fellowships, the Order of Canada, which celebrates its 50th anniversary this year. By virtue of their membership and rank, each has the right to wear an exclusive insignia that is recreated on the coin’s design. It’s a prestigious emblem that represents Canada at its very best—a nation’s badge of honour for outstanding achievement, dedication and merit, as reflected in the Order’s motto: Desiderantes meliorem patriam (“They desire a better country”). Prior to 1967, Canada did not have an honours system of its own. Deserving Canadians were typically recognized with British honours, with the exception of a select few Canadian medals. The idea of home-grown honours was periodically raised then revisited throughout the late 19th century and early 20th century; but in 1966, the idea came to fruition when the concept was championed by Prime Minister Lester B. Pearson to coincide with Canada’s centennial celebrations. Created in 1967 by Her Majesty Queen Elizabeth II, the Order of Canada represented a defining first for a nation that had come into its own. Two ranks—the Companion and the Medal of Service—were initially created to recognize Canadians for their service to Canada or to humanity at large. In 1972, the Order was expanded into the three-tiered structure in place today: Members(C.M.) are recognized for contributions to a particular community, group, or field of activity; Officers (O.C.) are appointed on the basis of highly meritorious service at a national or international level; and Companions (C.C. )have demonstrated outstanding achievement and merit of the highest degree through outstanding contributions to their country or humankind. FEATURES THE ENGRAVED DATES “1967-2017”: The double dates of “1967-2017” are included to represent the 50th anniversary of the Order of Canada. EXCEPTIONAL SERIES, EXCEPTIONAL CANADIANS: This is the third coin in a 4-coin series that explores the highest honours in Canada’s Honours System. Subscribe today to receive all four coins. 99.99% PURE SILVER! Your coin is GST/HST exempt. 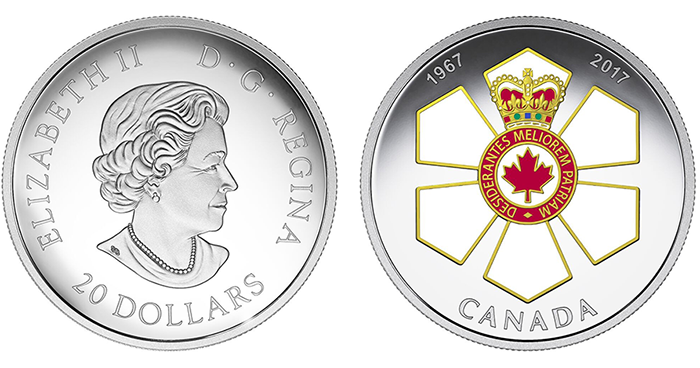 Your coin presents a faithful recreation of the Companion of the Order of Canada insignia, in commemoration of the 50th anniversary of one of Canada’s highest honours. Designed in 1966 by Bruce W. Beatty, C.M., S.O.M., C.D., the insignia of the Order of Canada is shaped in a stylized, hexagonal snowflake that is a fitting symbol for Canada’s northern climate; it is also strongly symbolic, since every snowflake is as unique as each recipient’s contribution to their country. Here, the coin’s reverse recreates the six symmetrical points that lead to an annulus at the centre, where a red-coloured maple leaf indicates the Companion rank. The Order’s motto, DESIDERANTES MELIOREM PATRIAM (“They desire a better country”), is circumscribed around Canada’s beloved national symbol, which is surmounted by the Royal Crown. Like the prestigious insignia itself, the coin is struck in fine silver; the application of colour on this numismatic piece also mimics the complex and colourful enamelling of the iconic insignia that symbolizes Canada at its best. The obverse features the effigy of Her Majesty Queen Elizabeth II by Susanna Blunt. 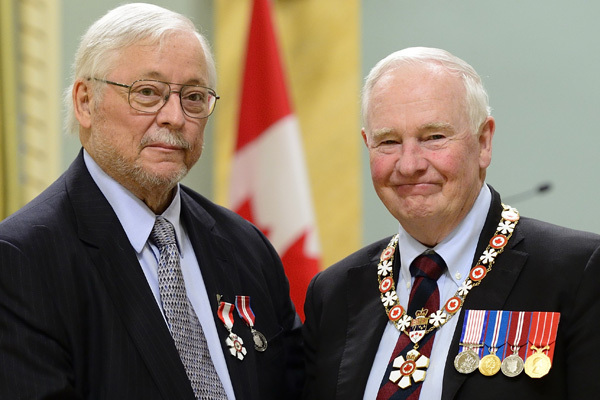 Calamai would receive his Member of the Order of Canada insignia on May 13, 2015.